The CrossFit furniture collection by Dutch-German design duo Janne Schimmel and Moreno Schweikle turns digitally manipulated objects and surfaces into real furniture. The two chairs in Schimmel & Schweikle's CrossFit series combine archetypal, minimalist furniture designs with organic shapes, "morphing" them together to create new forms. The strict lines of the modern-style furniture that the pieces are based on is emphasised by a shiny, lacquer-like finish achieved by coating the pieces in car paint, while the blob-like upholstery additions are finished in a soft artificial fur. Each piece is the result of a digital modelling experiment, which the designers have translated into a real object. "The 3D-modelling software allows us to 'ignore' the purpose of these volumes and freely shove different elements into each other," the designers told Dezeen. "Rather than take two principles and unify them into one new shape we kept both form languages perfectly intact – the only intervention being the morphing. The reference to the archetype remains clear and can be appreciated in a new way. Two seemingly different ways of thinking can be united into one piece and tell a new story where different points of view are highlighted," they continued. "The fake fur allows us to hide the connection points between the hard and soft elements making it seem like they effortlessly flow into each other like they would do in the 3D-modelling software." 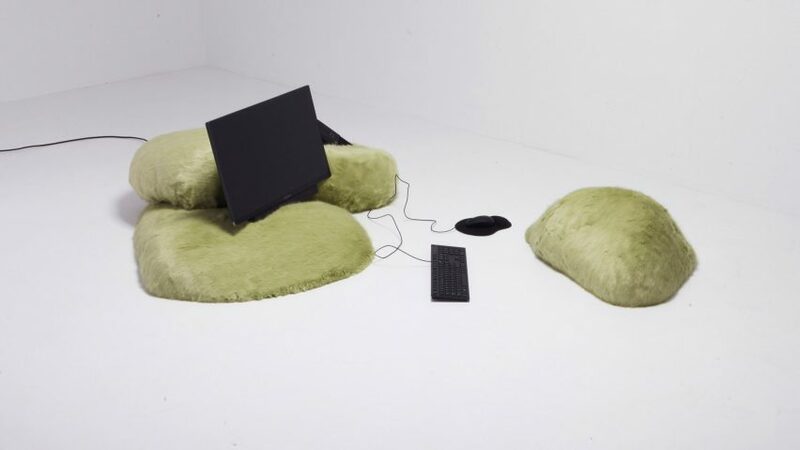 The third piece in the collection features a standard desktop computer combined with green, fur pillows, and is intended to sit on the floor of a living room. "Since the computer has taken such an important role in our lives we think that it deserves a more prominent place in our households," said the designers. "By bringing it from the desk onto the floor of the living room we want to challenge the way we engage with the computer." The CrossFit collection was designed during a three-month residency with the new Belgian gallery Alfa.Brussels, which provides young designers and artists with workshop space and accommodation in Brussels to help provide the breathing space needed to create new limited-edition and one-off pieces. Alfa.Brussels staged a solo show of Schimmel & Schweikle's new work in its booth at this year's Collectible, the Belgian collectible design fair, which ran from 14 - 17 March. Two new additions to their Return To Default collection were also included in the exhibition. Return To Default focuses on the archetypal office chairs, with each design manipulated in 3D software to create stretched, expanded or multiplied forms. For Collectible they showed two new versions of an oversized conference chair, one with a lamp integrated into its body at an unusual angle, reflecting some of the ideas developed in the CrossFit pieces. The chair is coated in a leathery finish. "In the digital world it is very easy to drag any material onto any given object without facing the difficulties such a material might bring in the real world," said the designers. "We wanted to find out if we could find a way to apply materials such as is done in the digital space," they explained. "We came across a company called Lanstones who produce a spread-on material that mimics the properties of leather. The property of the material allows us to spread it onto our shape and eliminates the need for seams that you will find in traditionally leather-upholstered furniture." Schimmel and Schweikle met during their studies at Design Academy Eindhoven and launched their joint studio at the school's graduation show with Return To Default. Both also run individual design businesses under their own names.